Over the past 50 years, advances in our understanding of the underlying pathophysiology of MDD have yielded an impressive array of antidepressant agents and improvements in treatment. Pharmacologic research has been focused primarily on the monoaminergic system in the quest to develop safer and more effective agents.8 However, new insights into the role of neuroplasticity and the glutamatergic system in the pathogenesis of MDD and TRD8 may lead to the successful development of new therapeutic modalities. Currently prescribed antidepressants have limitations, with approximately 1 in 3 patients not achieving remission.9 In addition, recurrence may occur in patients who initially respond to treatment. Despite all of the advances in MDD treatment and research to date, new agents are needed for patients who do not achieve remission during treatment. This publication identifies the socioeconomic consequences and unmet clinical needs in patients with MDD and TRD, provides a review of current therapies set forth by American Psychiatric Association (APA) Practice Guidelines,10 and describes novel, emerging treatment approaches that may meet the unmet needs of these patients. MDD has been estimated to result in nearly 400 million disability days per year, more than most other disease states,12 and depressive episodes result in some of the highest costs associated with disability, compared with other conditions.15 The monthly work-related cost of lost productivity attributed to depression is estimated to be nearly $2 billion,16 given that workers with moderate-to-severe depression are more likely to miss work. The financial burden of MDD continues to grow; annual costs associated with the disorder in the United States increased 21.5% in 2010 over the previous 5 years, rising to $210.5 billion (adjusted for inflation).14 This increase is primarily driven by 2 factors: medical or direct costs and presenteeism costs. More importantly, a growing body of research is now focused on the critical role played by the amino acids glutamate and gamma-aminobutyric acid (GABA) in the pathophysiology of MDD. Glutamate has been identified as the major excitatory neurotransmitter in the human nervous system since the 1980s,22,23 and research in this area represents a major advancement in the understanding of MDD. 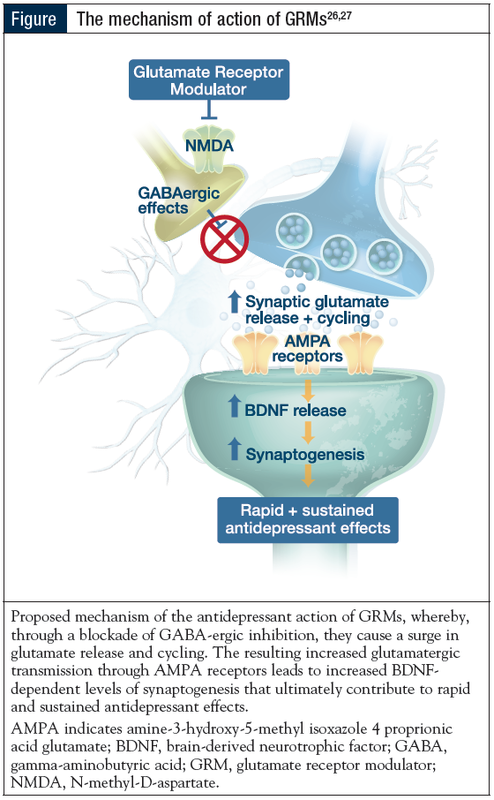 Research into the glutamatergic system represents the most significant advance in the understanding of depression in the 60 years since the development of monoamine antidepressants, and holds promise that a new class of antidepressant agents with a novel NMDA receptor antagonist mechanism of action may be developed in the future. Adjunctive therapy to manage the adverse-event profile of the antidepressant. The landmark STAR*D trial raised some concerns, given the number of patients who did not achieve remission or who relapsed even after remission, despite the many therapeutic modalities available. After factoring in the time spent in undertaking numerous trials of antidepressants over a prolonged time frame, the cost of treatment and medical care, and the significant impact on quality of life, it is clear that a need exists for more therapeutic alternatives in MDD and, in particular, TRD. Other antidepressant agents targeting the glutamatergic system that are currently in clinical development for MDD and TRD include an NMDA receptor partial agonist40 and a kappa opioid receptor antagonist.41 The opioid theory suggests that since opioid receptors modulate serotonin, an opioid receptor antagonist may work in patients who do not respond adequately to conventional antidepressant therapy.41 Another promising approach under investigation is the use of an opioid receptor modulator.42 Antidepressants that target the GABAergic system are also in development. Despite treatment advances and the extensive antidepressant armamentarium currently available to treat MDD and TRD, remission is an unachievable goal for many patients battling depression. A significant number of patients either do not respond or relapse with current treatment, resulting in significant challenges. Researchers continue to seek answers by looking beyond monoamines to other neurotransmitter pathways implicated in the pathogenesis of depression. Exploring the role that neuroplasticity and synaptic connectivity play in depression has opened the door to the development of new therapeutic modalities that go beyond conventional treatments targeting serotonin, norepinephrine, and dopamine. One of the most promising avenues is targeting glutamatergic neurotransmission to develop new faster acting and effective antidepressant agents. Novel antidepressant modalities currently in late-stage development and some currently being reviewed by the US Food and Drug Administration, such as the new class of GRMs and NMDA antagonists, hold promise in meeting the unmet needs of patients with TRD. National Institute of Mental Health (NIMH). Major depression: definitions. NIMH website. www.nimh.nih.gov/health/statistics/major-depression.shtml. Last updated November 2017. Accessed December 9, 2018. Rush AJ, Fava M, Wisniewski SR, et al. STAR*D Investigators Group. Sequenced treatment alternatives to relieve depression (STAR*D): rationale and design. Control Clin Trials. 2004;25:119-142. Depress. Merriam-Webster Dictionary website. December 10, 2018. National Institute of Mental Health (NIMH). Depression: overview. NIMH website. www.nimh.nih.gov/health/topics/depression/index.shtml. Last revised February 2018. Accessed December 2, 2018. World Health Organization (WHO). Depression. WHO website. www.who.int/en/news-room/fact-sheets/detail/depression. Published March 22, 2018. Accessed November 24, 2018. Institute for Clinical Systems Improvement (ICSI). Depression: appendix D – special populations. ICSI website. www.icsi.org/guideline_sub-pages/depression/appendix_d__special_populations/. Accessed December 10, 2018. Birrer RB, Vemuri SP. Depression in later life: a diagnostic and therapeutic challenge. Am Fam Physician. 2004;69:2375-2382. Pittenger C, Duman RS. Stress, depression, and neuroplasticity: a convergence of mechanisms. Neuropsychopharmacology. 2008;33:88-109. Gelenberg AJ, Freeman MP, Markowitz JC, et al; Work Group on Major Depressive Disorder. Practice Guideline for the Treatment of Patients With Major Depressive Disorder. 3rd ed. Washington, DC: American Psychiatric Association; 2010. https://psychiatryonline.org/pb/assets/raw/sitewide/practice_guidelines/guidelines/mdd.pdf. Accessed December 10, 2018. Kessler RC. The costs of depression. Psychiatr Clin North Am. 2012;35:1-14. Greenberg PE, Fournier AA, Sisitsky T, et al. The economic burden of adults with major depressive disorder in the United States (2005 and 2010). J Clin Psychiatry. 2015;76:155-162. GBD 2015 Disease and Injury Incidence and Prevalence Collaborators. Global, regional, and national incidence, prevalence, and years lived with disability for 310 diseases and injuries, 1990-2015: a systematic analysis for the Global Burden of Disease Study 2015. Lancet. 2016;388:1546-1602. Miles M. Survey of U.S. workers reveals impact on productivity from depression. American Psychiatric Association/Center for Workplace Mental Health website. www.workplacementalhealth.org/Mental-Health-Topics/Depression/Survey-of-U-S-Workers-Reveals-Impact-to-Productiv. Accessed December 10, 2018. Dewa CS, Chau N, Dermer S. Examining the comparative incidence and costs of physical and mental health-related disabilities in an employed population. J Occup Environ Med. 2010;52:758-762. Birnbaum HG, Kessler RC, Kelley D, et al. Employer burden of mild, moderate, and severe major depressive disorder: mental health services utilization and costs, and work performance. Depress Anxiety. 2010;27:78-89. Clark M, DiBenedetti D, Perez V. Cognitive dysfunction and work productivity in major depressive disorder. Expert Rev Pharmacoecon Outcomes Res. 2016;16:455-463. Hasler G. Pathophysiology of depression: do we have any solid evidence of interest to clinicians? World Psychiatry. 2010;9:155-161. Mora F, Segovia G, Del Arco A, et al. Stress, neurotransmitters, corticosterone and body-brain integration. Brain Res. 2012;1476:71-85. Dale, E, Bang-Andersen B, Sánchez C. Emerging mechanisms and treatments for depression beyond SSRIs and SNRIs. Biochem Pharmacol. 2015;95:81-97. Dantzer R, O’Connor JC, Freund GG, et al. From inflammation to sickness and depression: when the immune system subjugates the brain. Nat Rev Neurosci. 2008;9:46-56. Orrego F, Villanueva S. The chemical nature of the main central excitatory transmitter: a critical appraisal based upon release studies and synaptic vesicle localization. Neuroscience. 1993;56:539-555. Sanacora G, Treccani G, Popoli M. Towards a glutamate hypothesis of depression: an emerging frontier of neuropsychopharmacology for mood disorders. Neuropharmacology. 2012;62:63-77. Duman RS. Pathophysiology of depression and innovative treatments: remodeling glutamatergic synaptic connections. Dialogues Clin Neurosci. 2014;16:11-27. Serafini G. Neuroplasticity and major depression, the role of modern antidepressant drugs. World J Psychiatr. 2012;2:49-57. Aleksandrova LR, Phillips AG, Wang YT. Antidepressant effects of ketamine and the roles of AMPA glutamate receptors and other mechanisms beyond NMDA receptor antagonism. J Psychiatry Neurosci. 2017;42:222-229. Sanacora G, Schatzberg AF. Ketamine: promising path or false prophecy in the development of novel therapeutics for mood disorders? Neuropsychopharmacology. 2015;40:259-267. Pratt LA, Brody DJ, Gu Q. Antidepressant use in persons aged 12 and over: United States, 2005–2008. Hyattsville, MD: National Center for Health Statistics; 2011. NCHS data brief 76. Jakubovski E, Varigonda AL, Freemantle N, et al. Systematic review and meta-analysis: dose-response relationship of selective serotonin reuptake inhibitors in major depressive disorder. Am J Psychiatry. 2016;173:174-183. Al-Harbi KS. 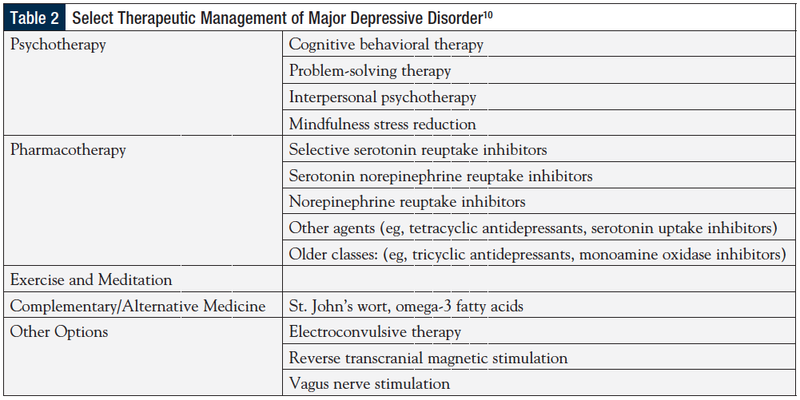 Treatment-resistant depression: therapeutic trends, challenges, and future directions. Patient Prefer Adherence. 2012;6:369-388. Mrazek DA, Hornberger JC, Altar CA, et al. A review of the clinical, economic, and societal burden of treatment-resistant depression: 1996-2013. Psychiatr Serv. 2014;65:977-987. Trivedi MH, Rush AJ, Wisniewski SR, et al. Evaluation of outcomes with citalopram for depression using measurement-based care in STAR*D: implications for clinical practice. Am J Psychiatry. 2006;163:28-40. DiBernardo A, Lin X, Zhang Q, et al. Humanistic outcomes in treatment resistant depression: a secondary analysis of the STAR*D study. BMC Psychiatry. 2018;18:352. Luthra S. Doctors often fail to treat depression like a chronic illness [Shots: Health News From NPR]. National Public Radio. March 7, 2016. www.npr.org/sections/health-shots/2016/03/07/469504900/doctors-often-fail-to-treat-depression-like-a-chronic-illness. Accessed December 11, 2018. US Department of Labor, Bureau of Labor Statistics. Occupational employment statistics: occupational employment and wages, May 2017—29-1066 psychiatrists. https://www.bls.gov/oes/2017/may/oes291066.htm. Last modified March 30, 2018. Accessed December 11, 2018. Carlat D. 45,000 more psychiatrists, anyone? Psychiatric Times. August 3, 2010. www.psychiatrictimes.com/adhd/45000-more-psychiatrists-anyone. Accessed December 11, 2018. US Department of Health & Human Services, Agency for Healthcare Research and Quality (AHRQ). Patient outcomes reporting for timely assessments of life with depression: PORTAL-Depression (Illinois). https://healthit.ahrq.gov/ahrq-funded-projects/patient-outcomes-reporting-timely-assessments-life-depression-portal-depression. Accessed December 11, 2018. Siu AL; US Preventive Services Task Force (USPSTF). Screening for depression in adults: US Preventive Services Task Force recommendation statement. JAMA. 2016;315:380-387. Zarate C Jr, Machado-Vieira R, Henter I, et al. Glutamatergic modulators: the future of treating mood disorders? Harv Rev Psychiatry. 2010;18:293-303. Allergan’s rapastinel receives FDA breakthrough therapy designation for adjunctive treatment of major depressive disorder (MDD) [press release]. Dublin, Ireland: Allergan plc; January 29, 2016. www.prnewswire.com/news-releases/allergans-rapastinel-receives-fda-breakthrough-therapy-designation-for-adjunctive-treatment-of-major-depressive-disorder-mdd-300212027.html. Accessed December 10, 2018. Karp JF, Butters MA, Begley A, et al. Safety, tolerability, and clinical effect of low-dose buprenorphine for treatment-resistant depression in mid-life and older adults. J Clin Psychiatry. 2014;75:e785-e793. Fava M, Thase ME, Trivedi MH, et al. Opioid modulation with buprenorphine/samidorphan combination for major depressive disorder: two randomized controlled studies [published online ahead of print October 29, 2018]. Mol Psychiatry. doi:10.1038/s41380-018-0284-1. DOV216,303. Revolvy website. www.revolvy.com/page/DOV%252D216,303. Accessed December 11, 2018. Ng QX, Koh SSH, Chan HW, et al. Clinical use of curcumin in depression: a meta-analysis. J Am Med Dir Assoc. 2017;18:503-508. MOA Magnifier™ is published by The Lynx Group, LLC, 1249 South River Rd, Suite 202A, Cranbury, NJ 08512. Copyright © 2018 by The Lynx Group, LLC. All rights reserved. MOA Magnifier™ is a registered trademark of The Lynx Group, LLC. No part of this publication may be reproduced or transmitted in any form or by any means now or hereafter known, electronic or mechanical, including photocopy, recording, or any informational storage and retrieval system, without written permission from the Publisher. Printed in the United States of America. The ideas and opinions expressed in this issue do not necessarily reflect those of the Editorial Board, the Editors, or the Publisher. Publication of an advertisement or other product mentioned in this issue should not be construed as an endorsement of the product or the manufacturer’s claims. Readers are encouraged to contact the manufacturers about any features or limitations of products mentioned. Neither the Editors nor the Publisher assume any responsibility for any injury and/or damage to persons or property arising out of or related to any use of the material mentioned in this publication. EDITORIAL CORRESPONDENCE should be addressed to EDITORIAL DIRECTOR, The Lynx Group, LLC, 1249 South River Rd, Suite 202A, Cranbury, NJ 08512. Phone: 732-992-1880. Correspondence regarding permission to reprint all or part of the article published in this supplement should be addressed to REPRINT PERMISSIONS DEPARTMENT, The Lynx Group, LLC, 1249 South River Rd, Suite 202A, Cranbury, NJ 08512.